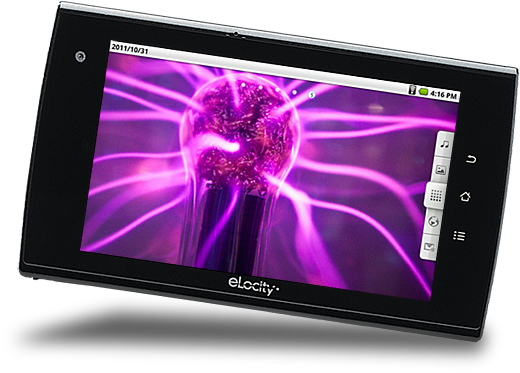 This revolutionary new Internet Tablet from eLocity combines the power of a lightning-quick PC with the functionality and mobility of a smartphone to create the ultimate technology companion. Built for the Android 2.2 operating system, this versatile device allows constant access to the web with built-in Wi-Fi and can be customized in virtually unlimited ways through thousands of Android apps available online. Power and speed are key features, but equally impressive are the bright, crisp 7-inch screen and the 3-axis accelerometer that will bring your games to life… arcade style. The eLocity A7+ Internet Tablet comes ready for use with a selection of pre-installed applications for Android 2.2 and can be customized with thousands of third-party apps that are currently available online. The crisp, clear, enhanced resolution 1024x600 pixel multi-touch screen responds to your slightest touch without the need for a stylus. The eLocity A7+ comes equipped with an input slot for a Micro SD Card, up to 32GB, increasing your media storage to 32 feature films, 320,000 photos, or 16,000 songs. With a strong internal 802.11b/g wireless receiver, the A7+ can connect to the internet through your home and office routers, or anywhere with a wi-fi hot spot. With Bluetooth 2.1 technology, the A7+ tablet can connect to A2DP audio headphones or speakers, allowing for high-quality wireless monitoring of audio and video content. To make sure you have access to thousands of Android apps, the A7+ comes with 3 pre-loaded app stores for maximum flexibility and countless choices. A gamer's delight, this unit packs processing speed that can easily power the most demanding 3D games available for the Android platform. Enhancing your experience is a 3-Axis Accelerometer that puts the pulse of the action in your hands. Wi-Fi signal and an online friend with a webcam to talk to, you're set. Watch HD films in the palm of your hand or use the HDMI output to send HD media to a big screen TV in true 1080p high definition. The A7+ isn't just a portable media player, it's a high definition media server! Access unlimited media on external flash memory devices — up to 64GB. An easy way to increase your media storage to 64 feature films, 640,000 photos, or 32,000 songs. If you're a reader, you're in luck. Use the pre-installed e-Reader application to download e-books that are easy to read in a vertical format with the A7+'s high contrast display. The QWERTY keyboard makes it easy to surf the web or use applications for email, social networking and office productivity. NVIDIA® Tegra 2 Processor - Faster than the iPad, this sleek unit has the fastest mobile CPU available today - NVIDIA's Tegra 2 T-250, Dual ARM 9 CPU (1GHz clock speed) with 8 separate processors that can run independently or together for maximum performance. Flash Support - With the eLocity A7+, web browsing is both easy and beautiful. 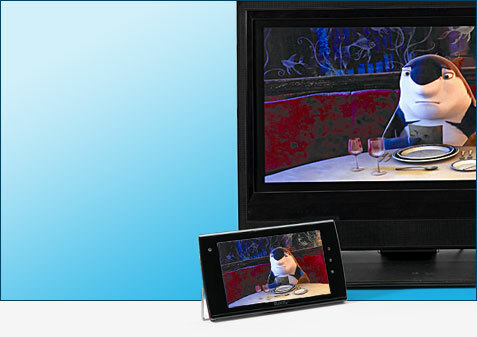 Most importantly, the unit supports Flash… so you'll be able to view web content the way it's meant to be seen! Internal Memory - The 4GB internal high speed flash memory can store up to 4 feature films, 40,000 photos, or 2,000 songs for countless hours of entertainment. Wireless & Bluetooth 2.1 - Constant connectivity with 802.11b/g wireless and Bluetooth offer maximum performance, and with the wireless status screen giving you information at a glance, it's easy to monitor and manage connection settings for VPN, Bluetooth and Mobile Networks. There's even an Airplane Mode that allows you to disable all wireless connections in a single place! Stereo Playback - The A7+ Internet Tablet comes with earbuds so you can enjoy your tunes in solo mode, and it also has built-in stereo speakers that allow you to share your music wherever and whenever you like. Plug 'n' Play - Finally a product that is ready to kick off from the word go - open your package, charge it up and you're on your way! No installation CDs, no signups, just experience your Android!